Fosjoas, the famous intelligent two wheel self balancing scooter manufacturer, always aims at producing various scooter types and satisfying different travel demands from people. 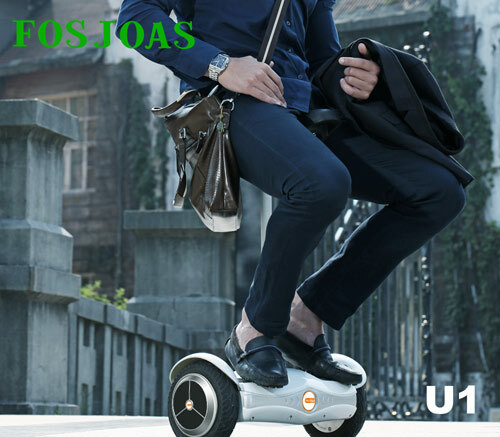 Fosjoas U1 mini electric scooter was published in last new product release conference and has attracted lots of consumers from different age stages thereafter. Although it has small figure, its internal function, application and consumer base is never inferior to others. The main reason why U1 electric scooter is designed into mini size is because Fosjoas wants to improve the portability of its product. However, it never lowers its standard in terms of internal function. Small figure decides light weight and U1 mini electric scooter just weighs 14kg. Then, riders even can carry it by hand or put in a bag. But, its maximum load capacity is as high as 100kg. Meanwhile, people whose height is ranging from 1.5m to 2.1m can ride Fosjoas U1 scooter at ease. Two small but powerful 8-inch Cheng Shin tyres benefit strong power and the tailor-made tread pattern improves the adaptability to some tough road conditions. At the same time, Fosjoas mini self-balancing scooter offers enjoyable riding experience, which benefits from double riding modes, including standing-posture riding and sitting-posture riding. Fosjoas U1 mini self-balancing scooter is equipped with a rise-and-fall saddle. If riders want to sit, they can pull out the saddle. Riders also can press it down if they want a standing riding. Wide applications and big consumer base are two important factors in bright market prospect. Fosjoas sitting posture self-balancing scooter has absolute advantages in this two aspects. For one thing, the maximum range of Fosjoas U1 mini electric unicycle is about 30km, which almost can cover all travel needs in people's daily life. For another thing, it is suitable for all people regardless of their age, weight and height.